Full framed retro slightly cat shaped plastic frame. Elegantly bold design with brush strokes of marble inlay within the frame. One of the seasons top trends! Perfect for the fashionista that wants the most current look without the drama of being overly retro. Full framed metal wire frame, with thick flattened metal arms. This look is exactly what the name states: Professional. If you are looking for a modern, sleek, well-educated style, The Professional is perfect for you. Full framed bold retro shaped plastic wayfayer with winged tips. Gloss double laminate coated providing a shiny colored two tone clear coat finish. Unisex design. 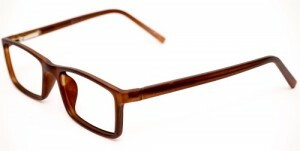 Full framed, square plastic, smooth ubran frame with an edgy hip look, and trendy enough to wear in the office. Matte colored to soften the boldness, but shaped impecably to compliment the face. Designed unisex. One of this seasons top trends! Beat there, or be square! Full framed thin square plastic frame with a soft matte rubber feel. The Scholar provides a slightly bold look, while not overwhelming the face with size. Unisex design. Large Square Rectangle Shaped Full Framed Plastic With Marble Metallic Accents. This Frame Is The Classic Square Trend With A Fierce Flare Of Glam For All Those Classy, Fun & Flirty Divas. © Copyright 2015 - Eyeglass Packages, LLC.